The Friday Find is a place where I showcase the beautiful work of handmade jewelry artists and creative entrepreneurs as a way to learn about beads, gemstones, or jewelry making techniques. In honor of the October birthstone, today’s feature showcases the beautiful opal. Opals are classified as mineraloids formed from a silica gel. Consequently, opals contain water, anywhere from 3% to 15% or more. Precious opals display an intense “fiery” brilliance and light show of many colors. As light is diffracted by the microstructure of the opal, you will see colors ranging from blue to green to red, and every color in between. 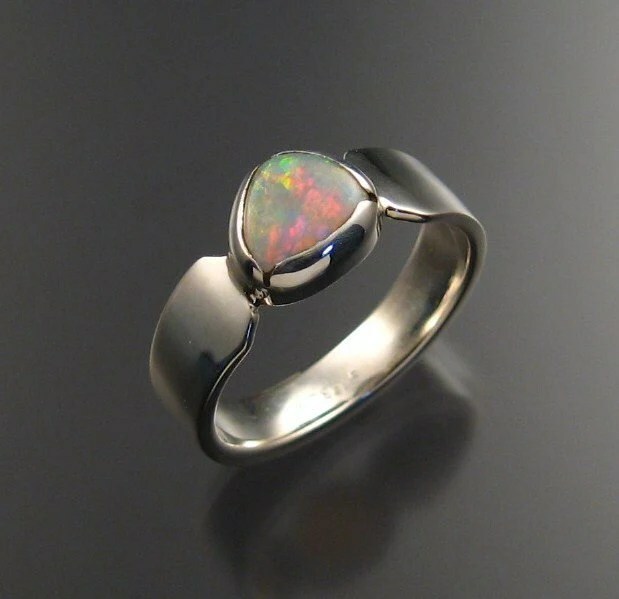 I stopped in my tracks when I saw this beautiful sterling silver ring showcasing a natural Australian opal. If you are looking for a precious opal, chances are that it will come from Australia. Greater than 95% of precious opals are mined there. Look for fiery brilliance and flashes of light which are called “play of color.” Precious opals will be slightly translucent, this is referred to as opalescence. Varieties of “common” opal will lack the translucence that precious opal has and will generally have less play of color. Photo credit: Opal Ring, Sterling Silver by Stone Fever Jewelry on Etsy. This image is protected under the copyright of the original artist with all rights reserved. It is reproduced here with the permission of the artist. Got a question? Contact me via email at Lynnette@beadsandhoney.com.